The Express is the story of Ernie Davis (played by Rob Brown), the first African American to win the Heisman Trophy. Davis was actually given the moniker of "The Elmira Express" since he was from Elmira, New York. Though based on a true story, the fact that the film's title has been modified to make it more marketable is indicative of the type of glossy Hollywood sports movie Davis' story has been turned into. The movie is a paint-by-numbers translation of that Hollywood standard, the "young athlete with loads of promise who meets a tragic end"- with a small measure of race politics thrown in. All of its potential edginess has been glossed over in favor of rousing action on the gridiron, and the movie suffers for it. Beginning with a Davis as a stuttering youth (Justin Martin), growing up in a small coal town outside of Pittsburgh with his grandfather, Pops (Charles Dutton), he moves to Elmira with his mother, where he joins a small-fry football league. Eventually he is actively being sought after by 50 colleges, no small feat for a black man in 1959. 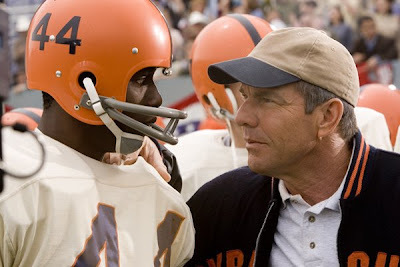 But it isn't until coach Ben Schwartzwalder (Dennis Quaid), and football legend Jim Brown (Darrin Dewitt Henson), come calling that he decides to join their team, the Syracuse Orangemen. As a sophomore, Davis leads the team to an undefeated season and a win over the #2 ranked Texas Longhorns at the Cotton Bowl. Despite facing racism at nearly every point in his life, he eventually becomes the first African American to win the Heisman Trophy and goes on to play for the Cleveland Browns. His career is cut short, before he ever plays one game for the NFL, when he develops leukemia in 1962. The movie falls prey to the usual downer sports movie touches that have become cliche over time. It's not enough that Davis will meet a tragic end. The viewer's sympathies are immediately manipulated by making the child Davis a stutterer, only for the stammer to disappear once we leave him as a youth. The film cuts to his grandfather's funeral briefly, in the midst of his rapid rise to stardom in college and all the hoopla surrounding it. But is there any emotion attached to the event? When Davis is informed of Pops' death, the camera takes it in from afar, cutting us out from what must be a weighty moment in the athlete's life. We get early hints that Davis is headed for some bad news, in brief scenes where he suffers mysterious nosebleeds. But after a lengthy time spent establishing his astounding career in college (close to 20 minutes on the Cotton Bowl game alone), the discovery of his leukemia, and his response to it, are rushed. We never get an idea of how he coped with his short life after. Even the classic TV movie, Brian's Song treated a similar storyline with much more respect, making the tragedy, and its emotional fallout, the centerpiece of its film. Race politics are included as another in a long line of obstacles for Davis to overcome, but the method in which it is addressed is also typical for Hollywood. Much of this subplot focuses on Davis teaching a white man, Schwartzwalder, why it is wrong to stay quiet when faced with even the subtle racism of the day. We get an appreciation of what this white man learns, and how he becomes a better man for it. As for Davis, we see him attain near-mythic status as the young player who overcame a stammer, Pops' death, nosebleeds, and racism on and off the field to eventually be awarded as the best college football player of 1961. Outside of a small obligatory scene where he speaks of it to his cousin, we never get a true sense of how difficult it must have been to face the pressure of having such a symbolic role thrust upon him. I would have been interested in seeing Davis' interactions with Jim Brown, a well-known activist, who similarly had run-ins with the coach over institutionalized racism. The film is strongest when it's on the field. All the play action is shot tightly, and easier to follow than you might think due to some deft editing and cinematography. With such a dearth of football movies, it is worth watching if just for that. But unless you're a diehard football fanatic, you might want to consider waiting for The Express on video. The Express opens on October 10th in theaters across the country. This entry first appeared on Blogcritics on 8/20/08.